I'm a free-lance writer with a patchwork portfolio from novels and short stories to plays and performance poetry - my collection Crumbs from a Spinning World was published by Burning Eye Books in 2016, and I also have a focus on stage drama, both as a playwright and a reviewer. You can find out more about my activities on this website. My new book is the story of my hometown: FROME UNZIPPED - from Prehistory to Post-Punk, published July 2018 by Hobnob Press. 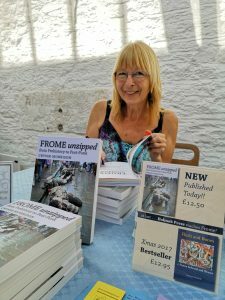 Frome, in southwest UK, has a lively arts scene which I write about weekly in my blog. I run the Poetry Cafe, and am involved with the summer festival and the Merlin theatre. This summer I will be back in the fabulous Greek island of Skyros leading a creative writing course from July 28 until August 10th. I'm also open for contact from community projects or individuals. © 2015 Crysse Morrison. All rights reserved.